With time, environmental effects, and genetic predisposition, skin can start to look dull and uneven, and fine lines may begin to appear. Microdermabrasion and chemical peels are some of the traditional methods used to combat these skin conditions; however, there is another option that can often provide faster, more dramatic results. MicroLaserPeel, the next generation of non-surgical aesthetic enhancement, is designed to improve the tone, texture, and color of skin. Patients often compare MicroLaserPeel to microdermabrasion, as they both treat the outer layer of skin. The MicroLaserPeel, however, typically offers safe, effective, and rapid skin resurfacing by going much deeper to improve tone and texture. The treatment can be as much as two to five times stronger than that of microdermabrasion, and the process is highly customizable, whether it’s minimal or maximal treatment. MicroLaserPeel treatment is designed to help correct a wide array of skin conditions, including sun damage, age spots, fine lines, pigment irregularities, keratoses, and scars on the face, neck, chest, and hands. Together with our facial plastic surgeon, Dr. Eugenie Brunner, patients can decide the level of rejuvenation that best suits their needs and goals. For more information about the MicroLaserPeel, or if you wish to schedule a consultation with Dr. Brunner, please contact our office today. The MicroLaserPeel procedure is designed to treat the deeper areas of the epidermis with a highly precise laser beam that ablates (vaporizes) dead and damaged skin cells. As a result, this procedure can offer superior results, unmatched by other popular treatments. Despite the fact that this method has the ability to reach greater depths than microdermabrasion, ultimately only a very thin layer of skin is affected. New, youthful skin cells emerge along the treated area during the subsequent healing process, often resulting in fewer fine lines, more even tone, and healthier-looking skin. Within a matter of days, skin is transformed from tired and dull to vibrant and youthful! Patients may wish to schedule several days off from work or other activities following the procedure, as the MicroLaserPeel can cause a sunburn-like redness on the face. No other advance preparation is usually required; however, Dr. Brunner may prescribe preventive medication to avoid development of cold sores prior to treatment. A topical numbing solution will be applied approximately 30-45 minutes prior to the procedure to help enhance patient comfort. After which, the area to be treated will be cleaned, and safety glasses will be placed on the eyes. The computer-guided laser operates through a handpiece that Dr. Brunner will position above the skin, and the laser beam will then move across the specified area. Most sessions last between 15 and 30 minutes, though that will vary based on the size of the area to be treated. One of the great benefits of MicroLaserPeel is that while this approach can penetrate more deeply than microdermabrasion, most patients report little discomfort, as the actual depth of the treatment is still quite shallow. At its lowest setting, the anesthetic cream may not be required at all; however, it will be utilized for higher, more intense levels. Following the procedure, patients may discover a “frosty” appearance to the skin. This layer of dry skin will typically peel or wash away within a few days. Redness and a sensation similar to a sunburn is common post-treatment, as is some mild swelling. Most individuals feel comfortable returning to normal activities, including work, within three to four days, though the intensity of treatment will often dictate the amount of downtime required. Recovery is typically brief, and is often compared to that of a chemical peel. Only the outermost layer of the epidermis is treated, typically providing rapid aesthetic improvement as the skin heals over the course of about three to four days. Benefits can include enhanced skin tone, texture, and evenness of color. To optimize results, a series of treatments customized by Dr. Brunner may be recommended. 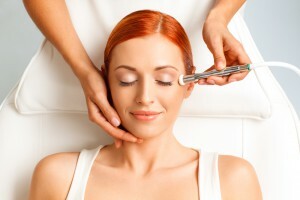 Each session is performed in her office and will be tailored to each patient’s unique skin conditions and desired results. The treated area will be sensitive to ultraviolet (UV) light following the procedure, so patients should avoid direct exposure to the sun until completely healed. Daily sunscreen use, as recommended by Dr. Brunner, can help to protect the skin from sun damage and common signs of aging. Most patients notice tighter, smoother, and more vibrant-looking skin after approximately four to five days, benefits that typically exceed those commonly experienced with microdermabrasion.